There are many exciting choices and decisions to consider when building a custom home, but with expert professionals to guide you, it can be a rewarding experience. Site evaluation is another service included at Meridian, helping clients find the perfect location and pinpoint its pros and cons. Photography by Nat Rea. A custom central island is a popular request for busy families. 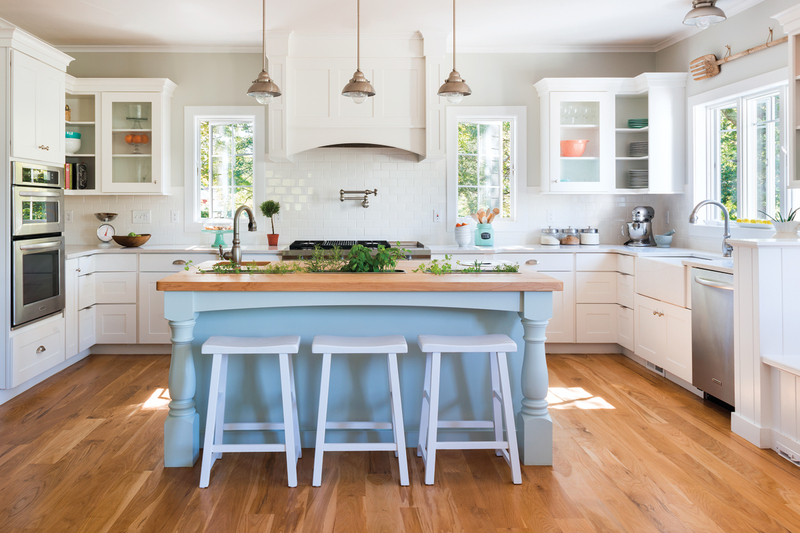 The Sherwin Williams Sea Salt color and butcher block top gives this one a unique style. Photography by Nat Rea. Hundreds of homeowners have relied on the Meridian team to help them create the perfect home design. 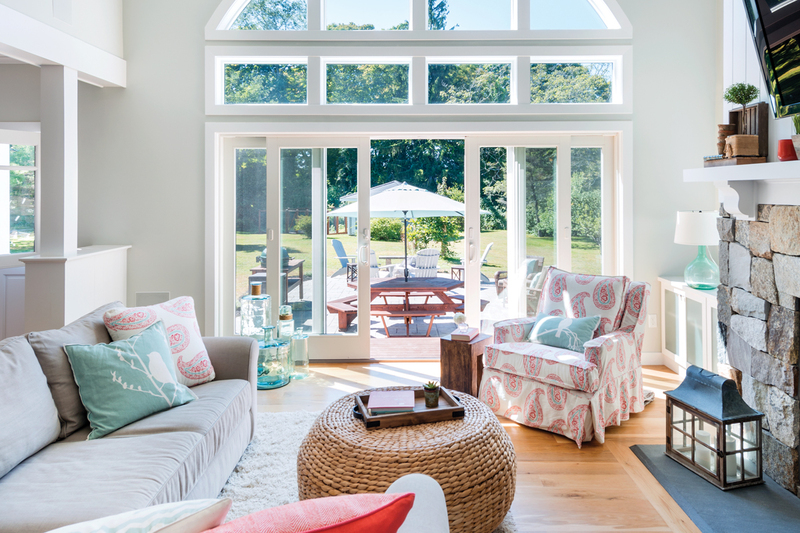 They have experience with a range of approaches: coastal shingle style, traditional New England, farmhouse contemporary and even executive manor. The process starts with thinking about how you like to live. Do you want large open areas? Do you do a lot of entertaining? Or is it all about family time? Your lifestyle impacts every decision, from material choices to floor plans to lighting. 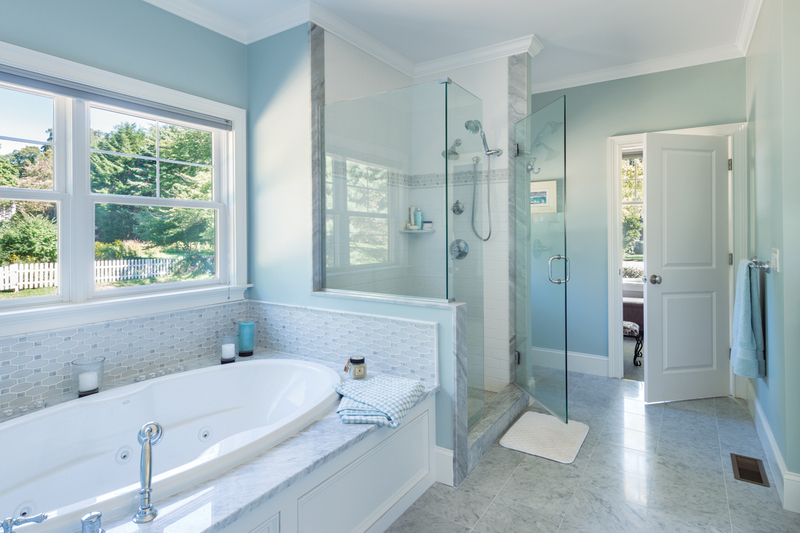 This master bath features classic Bianco Carrera Marble floors, carefully chosen accent tiles for understated flair and Benjamin Moore Woodlawn Blue walls. Photography by Nat Rea. Before building starts, Meridian helps clients take advantage of their view with proper site placement. “We work with clients to understand what it is they appreciate about their lot and view, then work with the engineer to make sure the placement of the house helps achieve their goal,” says Mitchell. To capture a coastal vibe, this home used natural materials: a rustic stone fireplace; a wide beadboard with custom mantle; and wide plank, country-grade white oak floors. 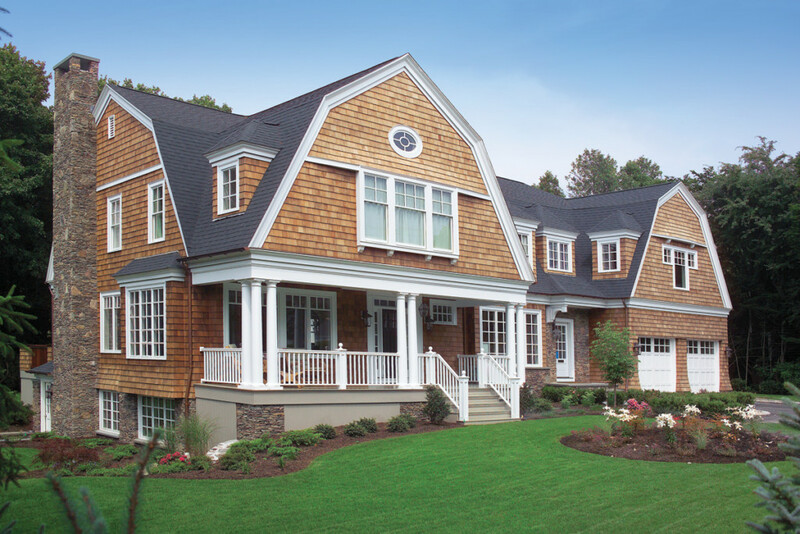 Meridian Custom Homes worked in collaboration with Red House Drafting and Design on this coastal New England home. Photography by Nat Rea. Kitchens and baths are key focal points and deserve lots of upfront attention. When designing the kitchen, keep in mind what appliances you want. Any extra plumbing or electrical work needs to be planned out well in advance, before the house is framed. Another popular home style is the rustic farmhouse look with a large open floor plan for easy entertaining. Think about a kitchen with a breakfast nook that flows into the family room and an open dining room. Warm, muted colors in organic tones evoke a sense of nature. Throughout, the wide, white oak floors with custom stain achieve that in-demand white wash effect. 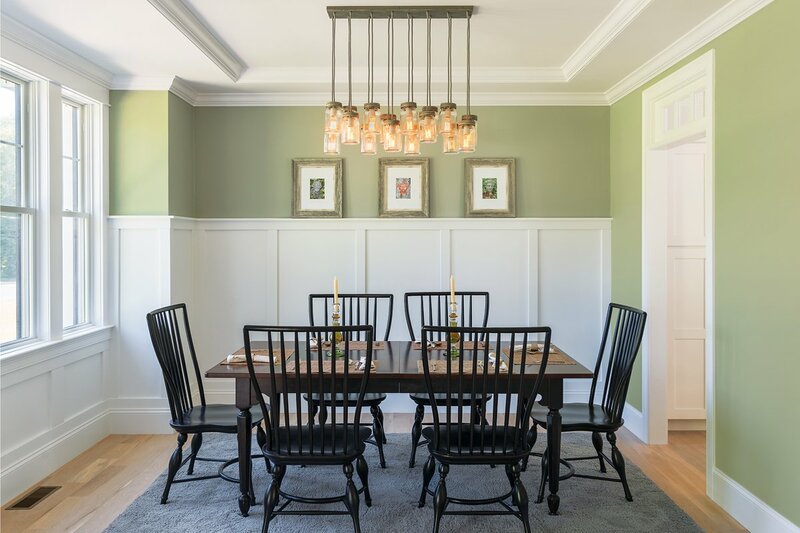 The board and batten wall embellishment and tray ceiling in the dining room add a touch of upscale that’s right at home with the informal style. A mason jar chandelier with Edison bulbs adds the perfect vintage but modern touch. Photography by Nat Rea. In the bath, the freestanding tub is positioned to take advantage of the natural light and views to make tub time more enjoyable. It’s important to plan the tub’s location early in the design process so plumbing can be brought up through the floor. Similarly, if you’re thinking about extra jets in the shower, plan early to allow for placement of diverter valves and extra plumbing. When designing for a busy, active family, every nook and cranny is taken into account. “We held many on-site meetings to understand exactly what they were looking for and how we could blend the home with the location they had chosen,” Mitchell explains. 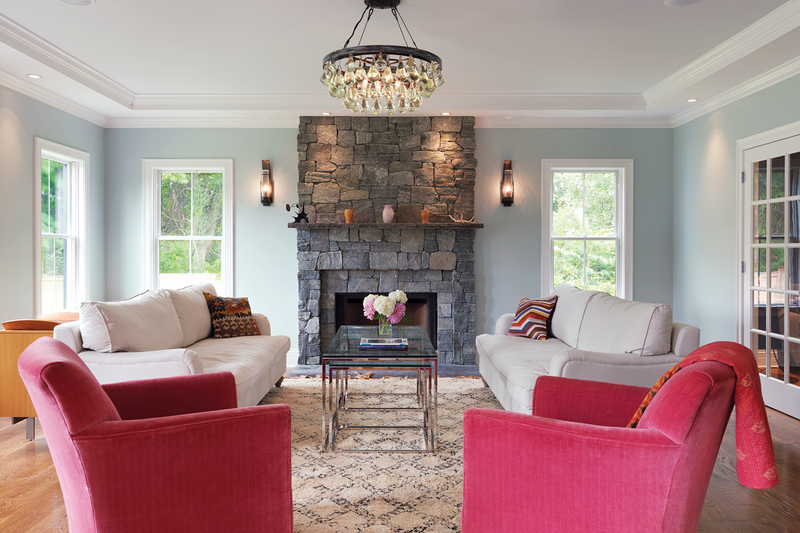 A floor to ceiling natural stone fireplace adds a rural touch to an otherwise modern living room. Photography by Nat Rea. Through their integrative and hands-on design process, the Meridian team delivered with an outstanding rural contemporary home that works for a modern lifestyle. Understanding the family’s needs led to the perfect mudroom with built-in bench plus storage for boots, bookbags and more. Take advantage of ceiling height with custom kitchen cabinets that reach to the ceiling for a modern look and more storage space. Glass front doors and accent lighting within will help show off your prized collectables. 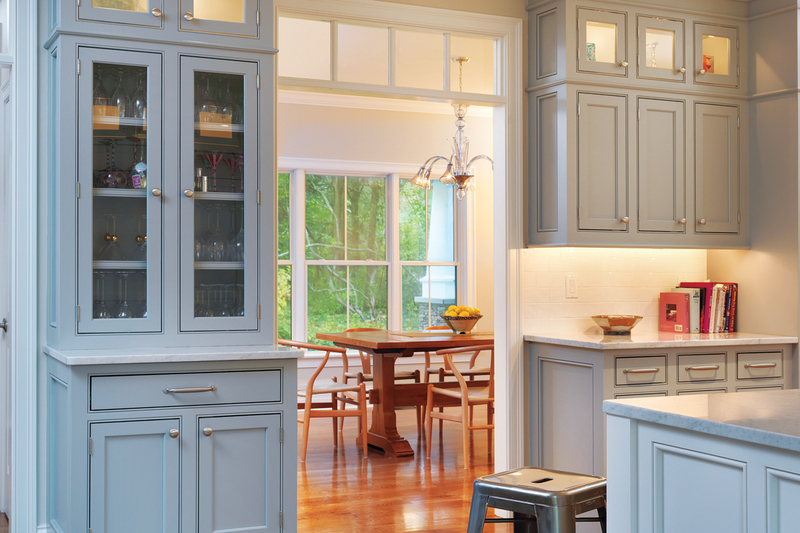 Undercabinet task lighting is essential for easier kitchen prep work. Here it also shows off the beautiful Bianco Carrara marble countertop below. An interior transom window in the archway between the kitchen and dining room allows more natural light to flow into the interior of the home. Photography by Nat Rea. Clients rely on Meridian to ensure they end up with the right design, material choices and specifications, no matter their style preference. Here, the rustic look was achieved with lots of natural materials including stone and wood. To add the contemporary touch, the team used clean, simple lines on the custom inset cabinets and infused understated elegance with their moulding choice. White oak floors and a palette of muted blue-gray carried throughout the home added to the calm aesthetic. With a fixed-cost construction approach and complete transparency, Meridian guarantees no financial surprises. Meridian’s philosophy is to partner with their customers in the construction of their dream home, working with them through every phase of the process. Their expert advice on spatial relationships, harmonious design aesthetics and superior construction details helps create a home perfect for your family and your lifestyle. No matter your preference, Meridian can achieve the style you’re looking for. “We take the guesswork out of building a home and make it an enjoyable, streamlined process from design through completion,” Mitchell says.